I don’t know about you, but at my family Thanksgiving, we have ALL the good stuff. Turkey, of course, next to mashed potatoes, at least two different kinds of stuffing, cranberry sauce, pie, and all the other fixings. Holidays are a time to gather together with loved ones around a table full of holiday spirit and delicious, comforting food—but you don’t have to break the calorie bank to enjoy a special day! Adding healthier recipes to the roster of family favorites is a great strategy for staying on track during the holidays. One way to do that is to provide your own healthy side dish that is full of veggies and micronutrients! This recipe is so quick and delicious, the whole family will expect it every year. Lightly spray with nonstick spray or foil line two baking sheets to roast the vegetables. After trimming ends and removing yellow leaves, slice all Brussels sprouts in half. In a medium bowl, combine halved Brussels sprouts, half of olive oil, salt, and toss to combine. In a medium bowl, combine cubed butternut squash, half of olive oil, maple syrup, and cinnamon, and toss to mix. Place butternut squash and Brussels sprouts on separate baking sheets, in a single layer. (You can bake both sheets simultaneously to save baking time.) Bake for 20-25 minutes, turning once halfway through baking, until softened. Ensure the Brussels sprouts brown, but do not blacken to avoid burning. 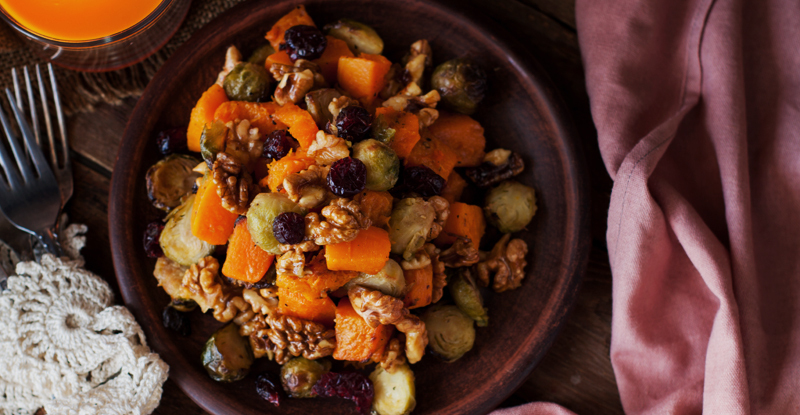 Combine the roasted Brussels sprouts and roasted butternut squash in a large bowl. Add Mix in pecans, cranberries, maple syrup, and cinnamon. Optional: For more sweetness, add 2 or 4 tablespoons of maple syrup. Do not add all maple syrup at once; start with an additional 1 tablespoon, then add more, if desired, and toss with the salad ingredients to .